In Florence something special, the exhibition “The Gallery of Tapestries. Epiphanies of precious fabrics” started on March the 20th and going on up to June the 3rd, 2012. It is a good opportunity of admiring the prestigious tapestries of the stored collections of the Uffizi. They had been hanging along the Uffizi Galleries and the Vasari’s Corridor up to 1987, when the princely manufactures, in need of restoration, were rolled in dark storage rooms, away from the public. Tapestries are precious works of craftsmanship relentlessly damaged by time, being their surface easily attacked by dust, insects and the law of gravity. Light, in particular, the main enemy of their brilliant colours, has to be checked up. A permanent exhibition hall, technologically arranged, is going, in a shortwhile, to be set up on the ground floor of the Uffizi to tell this peculiar passion of the Medicis. At first they had these works of art sent from the Flanders they had banking business with. 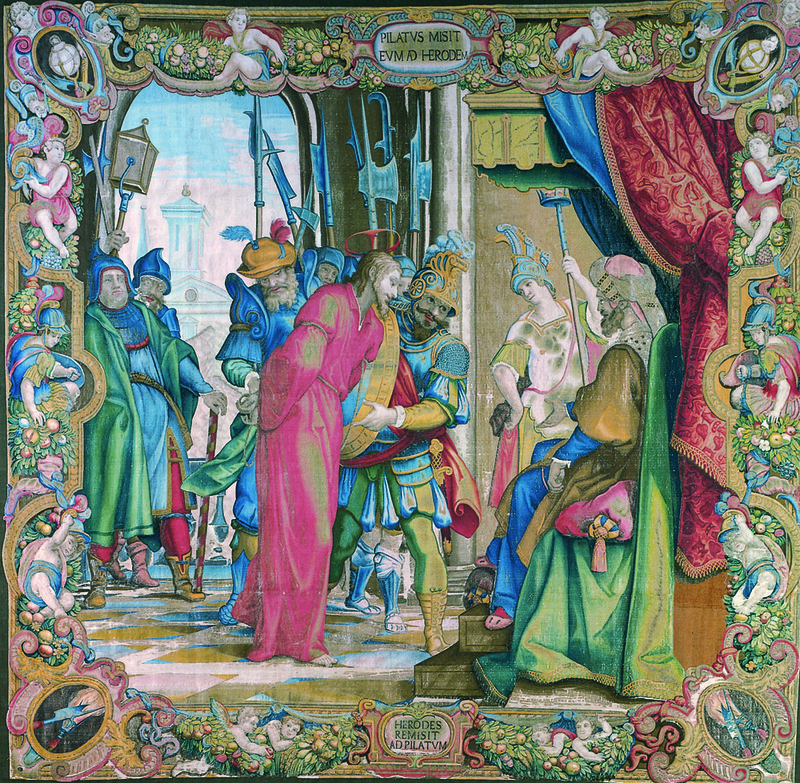 Later, in 1545, Cosimo the 1st established a Florentine tapestry manufacture under the guide of Niccolò Karcher and Giovanni Rost respectively from Mantua and Ferrara. 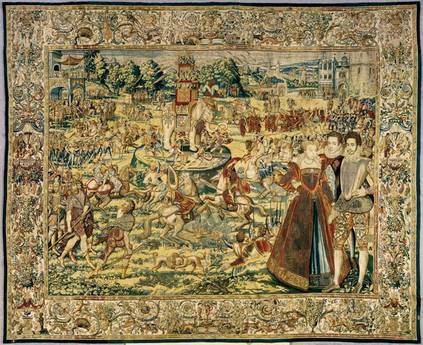 On show in the exhibition six Flemish tapestries from Brussels or Antwerp of the cycle of Jacob’s life, of the Battles of Hannibal and of the festivities held at the French Valois court in the second half of 16th century. These last are probably the most surprising ones for richness and details. Probably owned by Catherine de’ Medici they were presented to her granddaughter Christine of Lorraine on her wedding to Ferdinando de’ Medici, Gran Duke of Tuscany. 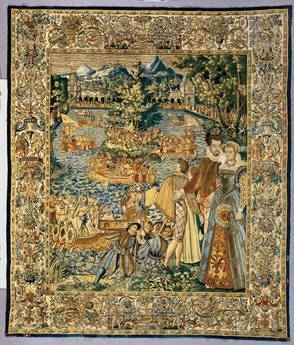 Catherine de’ Medici believed in the sumptuous court rituals, in the entertainments recorded in the tapestries. As written accounts of historical events they had to fulfill a precise political meaning. They were supposed to cunningly assess the enduring prestige and magnificence of the Valois dynasty after the past glories of Henry the 2nd or Francis the 1st . Thence the tapestries recording the French court festivals at Fontainbleu and Bayonne during Charles IX’s royal voyage around France or at the Tuileries ball for the Polish Embassy when Catherine’s son, Henry, was shortly appointed king of Poland before becoming Henry the 3rd of France. The exhibition includes, moreover, nine tapestries made in Florence, chosen among the ones of devotional subject, from the so-called Salviati cycle. Let’s remember as well the magnificent Ecce Homo, The Hunts on the cartoons by Vasari and Christ’s passion on the drawings of Alessandro Allori.